Besides dealing with the heat and other things I have been busy with I wasn't doing too much visual journaling. Then I got inspired by Mary Ann over at Dispatch from L.A. Mary Ann creates foot-stomping cool mailart and visual journals...and she digs stencils...she started cutting a few of her own -- and I realized it has been years since I'd done so. Quite a few years ago I was really into airbrushing and I used to create many stencils to incorporate into my airbrush art. *the piece of junk mail used in the piece above are the words ' any prescription'...I thought it was fitting with Jim Morrison...I LOVED this artist - and I thought he was a genius...drugged up, yes..but a genius nonetheless...Morrison is the stencil I created. WOW! You rock at creating stencils! I love what you did with them in your journal. 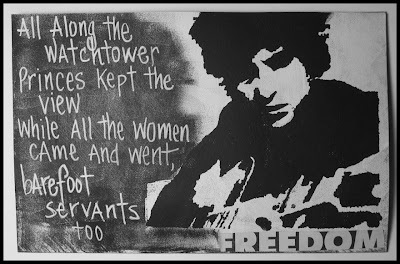 The Lizard King is one of my favorites too! Lovely art. Of course, I wouldn't expect less of you. dagny - wow, I wish I had that much confidence in myself ;-) Thank You! the black and white of dylan, the colors of jim and the psychedelic designs fitt perfectly into the subjects and time, jolene! beautiful! Gee thanks jolene! Now I am tempted to try my hand at cutting my own stencils...Like I am not doing enough different things already . LOL. gene ...WARNING...stencil cutting can be addicting :) I can't wait to do more!! Glad you liked the Morrison one. ohmyGOD! ACCKKK! Girl, you are really handy with that tool, watch out people! LOL! I love BOTH your stencil images. These stencils ROCK BIG TIME! SOCOOL! Not our children's stencils, that's for sure. Thanks for sharing your awesome art. Sell these! There's a market out there with a HUGE space that says JOLENE'S SPACE! your stencils are seriously detailed. really fabulous! Yo Mary Ann! Thanks - for the compliment - and for stopping by! OOH-LA-LA! What else can I say??? Tres magnifique, mon ami? The rest of my French pretty much consists of single words for fruits and vegetables...plus the lyrics to "Frere Jacque", so I'll stop there. But ooooooooh-la-la! Your imagery if fantastic and my favourite is the Morrison one. plumcrafty Kate - may I ask what you had in your tea? HA HA HA....you crack me up! Thanks for the compliment, no matter how overstated....LOL! 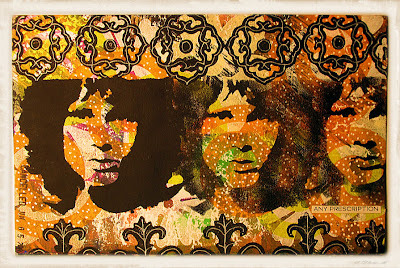 The Morrison stencil is amazing. I love the Doors and grew up listening to them because of my brother. He's 11 years older than I am, so I have unusually wild taste in music!! I specifically remember one particular early morning when I was a young girl. It was a hot summer and we didn't have any air-conditioning. I woke up at about 4:00 am because it was so hot and I had the words ~ "hello, I love you won't you tell me your name," ~"hello, I love you let me jump in your game" going through my head. Everytime I hear that song, I can smell my old house on a hot summer morning. I am glad my posts stir memories for you! Thanks for your compliment on the stencil and thanks for visiting!